10 motivated high school students from Grandview Preparatory School who are living, learning, and loving INNOVATION! Closing the Year with Great Progress! Though all of our local marine micro-algae samples died after Spring Break, we have since been very successful in culturing the marine green algae Nannochloropsis gaditana. We have 24 thick cultures. By mixing aquarium salt with distilled water, we can get our desired salinity content which is about 1.020sg. Then, we add micro-algae fertilizer at about 6ml/gallon. Finally, we inoculate the growth media with the cells. Last week, we were also able to acquire a sonicator, which we will use to lyse cells (essentially shatter the cell wall). Once this happens, lipids are released from the cell membrane into the solution. From here, we can refine the oils into biodiesel! As our plan comes into play, we will need to have funds to pay for any and all equipment or field fees that may arise. We are currently aiming for a minimum of $8000 dollars, which we hope will cover the cost of algae growth and analysis equipment, a diesel engine, other parts for a vehicle, and fees for field expeditions. Since our last post, Tasman has had communications with Professor Brad Elder at Doane College in Crete, Nebraska about our project. We will likely take our algae samples to Doane’s lab for analysis since much of equipment for lipid-analysis is very expensive. Also, Tasman was asked to speak at Stanford University on November about an algal-growth method he has been discussing with Professor Elder. Our Passion Project will now include some experimentation with this growth method, and using our isolated algal species, we will try using the system large-scale in Nebraska once we have done much of our research. Greetings from Grandview’s Scientific Research Team (SRT)! We are Tasman Rosenfeld, Jack Forney, and Bryan Hernandez, and our Passion Project this year will be focusing on how to develop and how to utilize algal biofuels. We will be blending our varied scientific interests by splitting the project into two parts. 1) Growing and stressing algae and making the biofuel, and 2) modifying a diesel engine to run off of the fuel. Striking all of our interest separately, this project also has the potential to actually change the world. If we discovered how to grow and stress a hardy species of algae that produces high lipid content in a cost effective way, it could cause vast changes to both our social and physical environment. 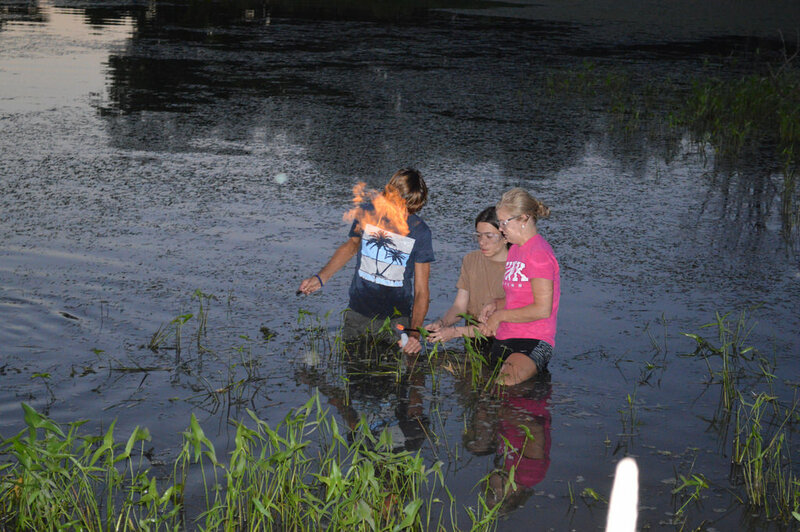 Tasman Rosenfeld taking algae pond samples and burning methane produced by anaerobic bacteria.